I recently purchased an Angel Gate (fakie pullip) by Solarsenshi. I had been admiring Solarsenshi’s work for quite some time and when I first saw pictures of Minty Milk Tea on her flickr photostream my heart just melted. 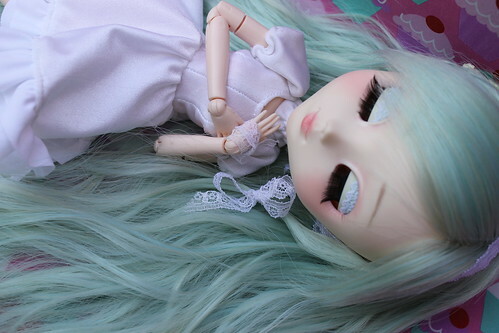 Minty Milk Tea was designed to be a sleeping girl, her eyelids are covered in delicate lace so they were not meant to opened (she does have acrylic eyes- I peaked!) I really loved the concept of an always sleeping girl. I’m absolutely delighted that I was able to adopt her. 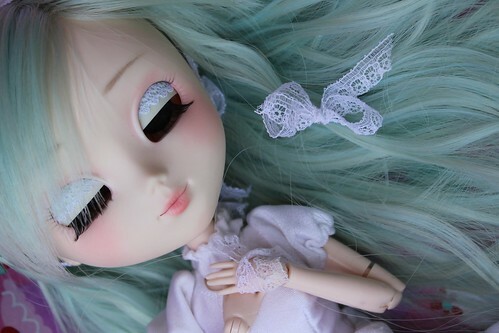 A little more information about Angel Gate- Angel Gate dolls are fake Pullip heads, they come as just a head with no face up they do not come with an eye mechanism (their heads were not really designed to hold them either) they show up on ebay from time to time. While I normally do not support bootlegs, I do see some merit to these primarily as customization practice like I currently have an idea for a fairly severe mouth modification that may well destroy the head I try it on and would much rather possibly destroy one of these than an actual Pullip head. There is a potential problem with these, they could be customized and then sold on as real with the exception of the eye mechanism issues they would be pretty hard to tell apart. 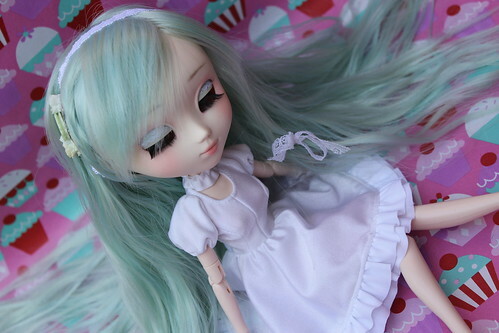 Minty Milk Tea was clearly designated as an Angel Gate doll but she was so beautiful I had to have her anyway. Pictures don’t do this girl justice, she is absolutely gorgeous. 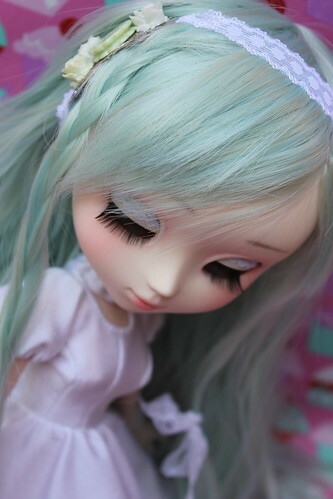 I love her soft face up and I loved that it was paired up with a pale minty wig. I think she is quite possibly my sweetest girl. I decided to use my cupcakes background to imply that she might be having sweet dreams. 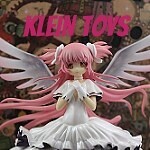 This entry was posted in 2011- 365 Toy Project and tagged angel gate, custom pullip, Pullip. Bookmark the permalink. I actually have an angelgate head as well for faceup practice and I will say, as good as they are, the more you work with them the more you notice they’re SLIGHTLY lopsided. The mouth is a little off and isnt as defined as an actual pullip. Other than that tho they’re worryingly close to the real thing. I noticed when I really looked at Milky Mint Tea she was a little different than Pullip, I was more concerned with less experienced people buying the heads thinking they are the real deal The only project I had planned that would require one would basically involve carving and resculpting the entire mouth so the mouth being slightly off wouldn’t bother me in that regard. Thanks, I absolutely love her if nothing else she will never ever be lonely here. I have a few Angel Gate Dolls. I knew they were bootleg from the beginning but they still look pretty amazing. I have them separated from my Pullips on my shelf.